LBN 534 (aka GAL 110-13) is a molecular cloud stretching across more than 1 1/2 degrees of sky in the constellation of Andromeda. 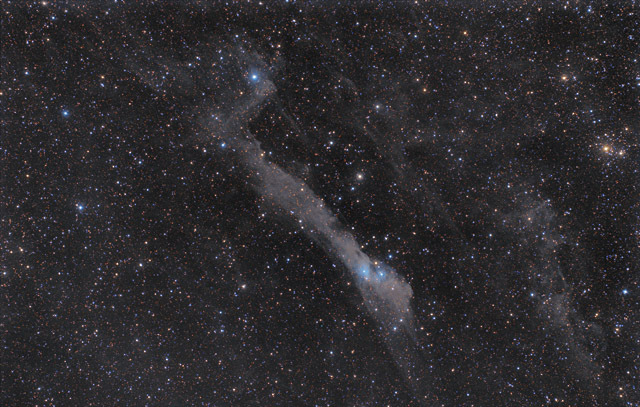 The cloud is believed to be part of the star forming Lacerta OB1 association and is about 1,400 light years from us. At the southern end of the cloud (bottom in this image) is the blue reflection nebula, vdB 158. Also shown at the far right in this image is the open cluster, NGC 7686 which contains about 80 stars. The annotated version of this image shows the location of a multitude of background PGC galaxies, as well as the small planetary nebula PK 110-12 1 (7:00 position from vdB 158). This image shows a section of sky roughly 3.4 x 2.1 degrees. In this image, North is Up. Software Used Images Plus 5.75 and 6.0 for camera control, Images Plus 6.5 for calibration, stacking, color channel splitting and recombination, ArcSinH stretching, star size reduction, edge masking, and feature mask. Photoshop CS5 used for levels and curves, screen mask invert, high pass filter, lab color, vibrance, saturation adjustments, selective color, and match color. Gradient Xterminator for gradient removal. Carboni Tools for additional noise reduction and smoothing. HLVG for additional color correction. Registar 64 for subexposure alignment and color channel alignment. Pixinsight 1.8 for automatic background extraction, star mask generation, multiscale median transformation, and morphological transformation. Notes I concentrated on minimizing the stars while processing this image and utilized some new techniques, including masked stretching. As a result, I think the final image has a good balance of stars and nebula. I like this field of view because it has such an interesting mix of objects - including a faint planetary nebula!